Your web address should be short, easy to remember and also convey the exact right message. To get started enter the name you want and click "Search". If the domain name is available, you can register it instantly. Which domain extension is for you? There are many extensions to choose from. You can even register multiple domains. Also known as ccTLDs (country code top-level domains) are great for connecting you with customers within a specific region. They are among the most popular primary domain names for businesses of all kinds. Also known as gTLDs (new top-level domains) will help create more awareness and interest in your business or brand. We would suggest you register your industry-related domain along with your Country domain for maximum exposure. Also known as TLDs (top-level domains) if you are targeting a market globally these domain types are best suited for you. Most businesses or individuals register a Country Domain and Global domain together. How do you manage your domain name? With our powerful Domain Manager, managing your domain is quick and easy. 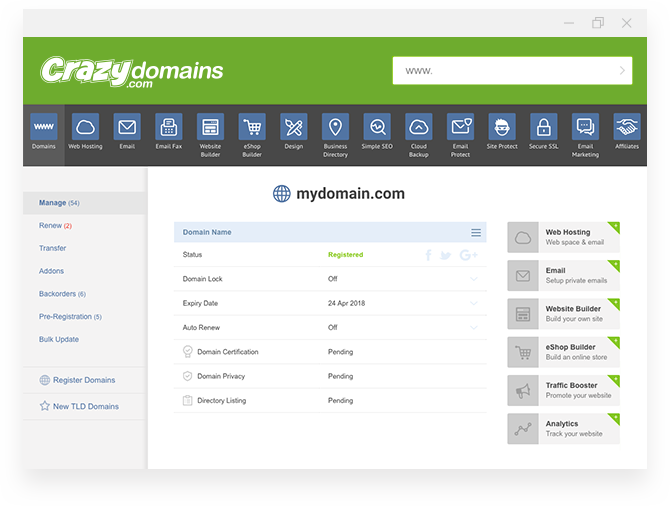 Manage all your domain names, renewals, billing and services in one place. Through our friendly Domain Manager which is included with every domain. With a simple "one click" setup feature you can connect your domain instantly to Web Hosting, Email Hosting or any services, without any tech knowledge. The Domain Manager comes complete with quick bulk update tools and domain folders allowing you to group and organise your domain portfolio easily. First, you need to choose the extension for your web address – such as .com.au or .co.uk. This is going to be a big part of your website and related services, so make sure you choose the one that matches the image you want to create. When you do a domain search, keep in mind that there are new options such as .travel, .design and .club. You can do a domain name search in the field at the top of this page and see all your available options. If your business is in Australia, then you’ll want .com.au, since that’s the most popular local option. It helps brand your website and identifies your website as Australian. New options for a domain name search in Australia include .melbourne and .sydney and can clearly highlight your target audience. Once you’ve chosen your extension, you need to choose the name itself. If your business is called Jack’s Cheap Tyres and is located in Australia, then register the domain name jackscheaptyres.com.au, jackstyres.com.au, cheaptyres.com.au or jct.com.au – the possibilities are endless. Our search function helps you choose the one that’s right for you. Always keep in mind that this name should be short, direct, easy to remember and most importantly, related to what you do. This makes it easy to search for your domain and hard to forget it. Once you know which one you want, enter it in our search and we’ll see if it’s available. If it is, you can get it right away. If not, you’ll have to search domain names in a different extension – or Backorder your first choice if the expiry date is close. You can do a WhoIs search to find the date when a registration expires. How long does domain registration take? Domain registration happens instantly in most cases. We’ll send you a confirmation email as soon as everything goes through. Delays in registration can happen for a couple of reasons and are primarily caused by requirements of the relevant TLD. For example, .au domains require eligibility criteria to be met before they can be registered and if the data provided isn’t 100% clear, then we may need to work with the governing body (auDA for domain name registration in Australia) to complete the registration. Before your website will become accessible on the Internet, the worldwide DNS databases need to be updated. These databases allow computers to search for an IP by its web address. Once this is completed, your website and related services will be available. Please note that your site may not immediately be visible in search engines due to their indexing practices. That depends on the registry, which sets the rules for that particular extension. Usually, the term is from 1 to 10 years. You can search our rules page for specific information concerning the extension that interests you. For registering a domain name in the Australian extensions (the .au options, including .com.au, .net.au, .org.au, .asn.au and .id.au), the minimum and maximum registration period is two years. Can I forward one domain name to another? If you are using our free standard DNS, you will need to change the A Record. On the management page, go to the DNS Settings section and add the record by clicking on the menu icon and selecting Add Record from the menu that drops down. For this, you’ll need to know the IP Address of the website or service you want to forward to. This can be found in most search engines by searching the name of the website and “IP address”. Alternatively, this information should be available from the provider where your site is hosted. Search their documentation for how to see your site’s IP. Make sure that your website or server is set up to accept the forward. Then you’ll need to change your nameservers to point at those of the site you want to forward to. If you have Premium DNS, then you can set up Web Forwarding by following these easy instructions. Can I register a domain name and host it anywhere? Yes. You’ll need to set up web forwarding, which you can do by changing the DNS records, or you can set it up instantly if you are using our Premium DNS service’s Quick Setup feature. For large orders AUD $1,000 we may be able to accept payments using alternative methods like wire transfers or direct deposits. Due to our low prices, these methods are not usually available. Please contact our support directly for more information about this. Contact us by email or at a local Australian phone number. Payment options that are available only in selected countries may be viewed on the payment page during checkout by scrolling down to the bottom of the page. Expert tech support on demand when you need it.